Loire Valley Tour featuring Châteaux de Chenonceau, Chateaux de Chambord, Azay-le-Rideau, Town of Chinon and Chateau Villandry’s Garden. Our Loire Valley mini-tour package includes services of your expert Loire tour guide, private transportation, wine tasting cost, and entrance tickets to sites indicated in the itinerary. Assistance in securing hotel, train tickets. NOTE: Your hotel will be based in Tours in the Loire Valley. 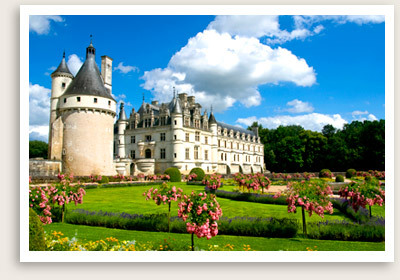 It is also possible to arrange private transportation starting in Paris to Loire Valley. Itinerary can be fully customized. Departure Points: Tours in Loire Valley or Paris. You will be picked up at your hotel in Paris for a beautiful drive into the Loire Valley, if you elect private transportation starting in Paris. If arriving by train, your guide will pick you up at the train station in Tours. Le Clos Lucé, former residence of Leonardo da Vinci. Strolling through the gardens, you will discover replicas of his most spectacular inventions. Châteaux de Chenonçeau, an elegant castle built on the Cher River. Enjoy a private guided tour by one of out elite guides in the Loire Valley. Château of Azay-le-Rideau is one of the finest examples of Renaissance architecture in the Loire Valley. Financier Gilles Berthelot’s castle, built on an island on the Indre River. The chateau features mullioned windows, pepper pots, dormers and a graceful staircase. Wine tasting at a vineyard in Chinon or Bourgueil, if desired. 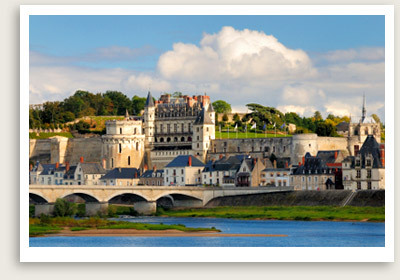 Historic Chinon, one of the most picturesque towns of the Loire Valley. Enjoy its medieval streets like an open-air museum of architecture and history. See amazing view of the Castle, decadent town houses built by the King’s financers or ministers. Chateau Villandry’s gardens, one of the most stunning gardens in Touraine, is an all-organic garden with more than a thousand linden trees and a number of theme gardens – the Love Garden, Kitchen Garden, Aromatic and Medicine Plant Garden, Water Garden and Sun Garden. Your tour guide in Loire Valley will unlock the natural wonders of a traditional medieval and Renaissance garden. Return to your hotel in the late afternoon or travel by train back to Paris. Private transportation can also be arranged.